Silent legend Charlie Chaplin takes satirical aim at Hitler and the Nazis in a dual role as Hynkl, dictator of Tomania, and a Jewish barber. The barber has suffered memory loss since World War One and returns to the ghetto to discover the oppression brought upon his people by the man with whom he shares a more than passing resemblance. And it’s also an uproariously funny comedy. I have reviewed, I think, over 100 films in my life, and this is the first I can truly describe as perfect. 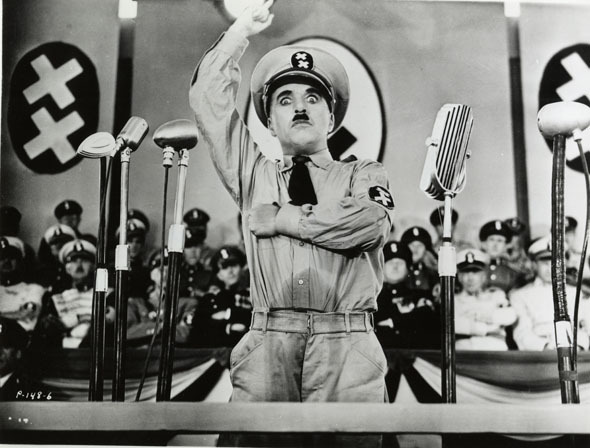 Written and directed by Chaplin in 1940, it’s fair to say this strikes while the iron is hot even if the topic of Nazi Germany and the oppression of Jews is far from the most obvious source of comedic material. One could even be forgiven for thinking this an impossible task, and Chaplin himself admitted he wouldn’t have made the film if he’d know the extent of the Nazis’ crimes. Yet he succeeds in making a brilliant comedy nonetheless, while never seeming unsympathetic to the Nazis’ victims. The amount of slapstick in this film could give the impression of being mere clowning around, but Chaplin shows that making a hated historical figure look ridiculous is an art form. The physical comedy here is second-to-none, packing almost every scene with hilarious, ridiculous movement. But it’s also amazingly written, with the dialogue getting as many laughs as the slapstick, mixed with a smattering of serious moments that capture the brutality of the conflict. Most of the film deals with issues that should either be hard to watch or completely distasteful, but Chaplin manages to be funny yet compassionate, and even moving. While he changes his appearance very little between the two characters, and their physical movements are very similar, they feel distinct from one another primarily by the voices he Chaplin adopts and the way they are written. The barber character is instantly likeable and makes sure the half of the film set in the ghetto is as interesting as the section that deals with the dictator himself. Every aspect of Hitler is mocked here, from his speeches to his dealings with Mussolini (Napoloni, in this film), from his vanity to his impulsive nature. The only comedy I can think of that comes close to pulling off the same cutting yet sympathetic, topical yet sensitive, controversial yet perfectly judged balance is Chris Morris’s terrorism based comedy Four Lions. Both deal with atrocities of the day and have the potential to upset a lot of people, yet hit the mark so precisely that they work. This film falls somewhere between Four Lions and Downfall, with a sprinkling of Dr Strangelove, and is easily as good as any of these. The Great Dictator is available free on YouTube.